Newly manufactured by CCI in the United States, this product is great for target shooting, tactical training, or general all-around plinking. Each round has a boxer-primed aluminum casing and non-corrosive powder. CCI is one of the ammo brands under the ATK parent company which is the world's largest manufacturer of ammunition. 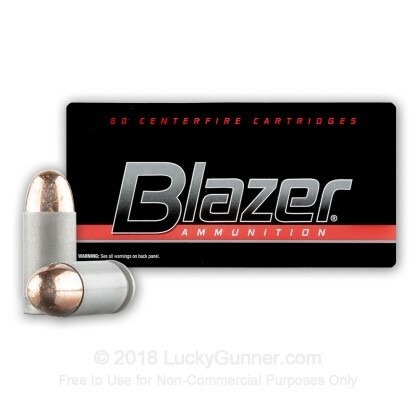 Blazer is CCI's budget range and training ammo and is available both in aluminum and brass case varieties. Today we're going to take a look at Blazer aluminum in 45 ACP which has been in production since the early 1980s. 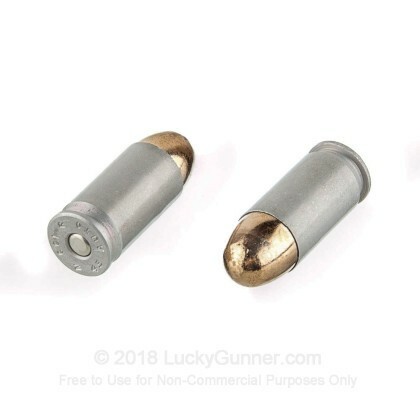 The 230 grain bullet is seeded in a case made from aircraft grade aluminum and utilizes a noncorrosive primer. There are not many companies making aluminum cased ammo, so sometimes people don't know quite what to make of Blazer aluminum. Just like brass, aluminum is much softer than the steel chamber of a firearm, so there's no risk of damaging your gun. Another cost saving measure of Blazer aluminum is the use of copper plating versus a traditional full metal jacket. Plating uses a chemical process to adhere the copper to the lead core bullet. And the plating covers the whole bullet rather than leaving the base exposed like with a full metal jacket. Performance should be pretty close for either bullet. But it's not recommended they you use plated bullets with a ported barrel since the ports can sheer off the plating as the bullet exits the barrel. Reliability with Blazer aluminum was great. I've never had any real problems with Blazer aluminum in any caliber. And for this test, the ammo ran great in all six of our test pistols with no feeding or ignition failures. With a muzzle velocity of 830 feet per second, the Blazer aluminum load is identical to the 230 grain, 45 caliber Blazer brass ammo. The only difference is the case. So if you don't plan on keeping your brass for reloading, Blazer aluminum is a nice low cost alternative. Accuracy was pretty good with a nice ten shot group. 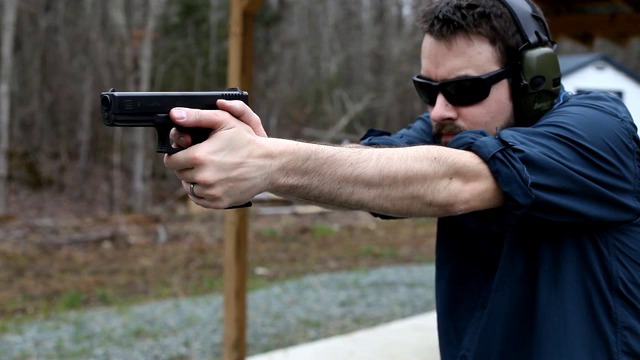 We used a Springfield Armory XDM at 15 yards from the bench to do our test. 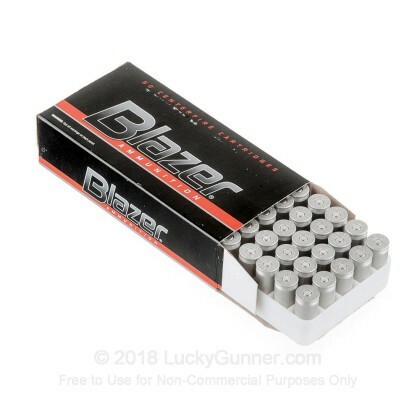 Blazer is great, low cost, American made range ammo, especially for anyone who doesn't plan on keeping their brass. I've used quite a bit of this ammunition and I must say I love it for several different reasons. If I can find this stuff on sale, I usually pick up 500 rounds of it. I've found it's just as reliable as most brass cased ammunition (just buy a few boxes and test it in whatever firearms you have to ensure it will work first). The price is usually reasonable but what I love most about this ammunition is the weight savings you get because of the aluminum cases. I was really surprised at how much less this ammo weighs compared to brass or steel cases when I first picked up 100 rounds of it to test in my firearms. I rarely shoot at an indoor range so I'm usually hauling my stuff wherever we're going to be shooting and getting some weight savings is nice when you have a lot to carry. Not to mention the fact that, if you're ever in a situation where you have to carry all your ammo with you on your person, then you can definitely carry a lot more of this ammunition than brass or steel cases. Highly recommended in any caliber! As expected, LG came through again. Availability and good price on ammo plus fast shipping. I've put a couple of hundred rounds through my new Ruger 1911 and had no problems. I don't reload so this ammo works fine for me. The only problem is, it doesnt last very long. I will be back to buy more. Great ammo. Great price. OUTSTANDING SERVICE. I've put a couple thousand rounds of this through my Springfield Armory 1911 Range Officer with no problems. It is as accurate as more expensive brass ammo. Lucky Gunner's prices and service are OUTSTANDING. Shipping was fast, the price was right, and it was Blazer quality. Be advised, the aluminum casings cannot be reloaded. 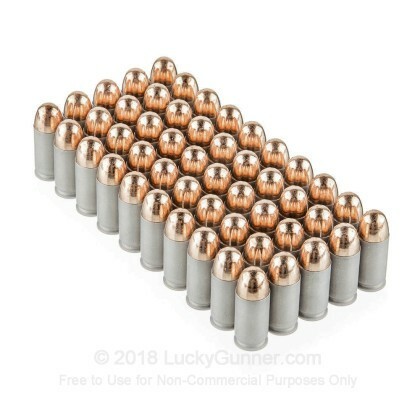 I have to say that I have bought quite a bit of ammo from Lucky Gunner and they are great! No problems ever with customer service and always quick shipping. But I did not like this ammo at all! I thought I was shooting a .357 magnum with the huge amount of flame that came out the end of the barrel, I could barely see the target 15 YDS away ( ok slight exaggeration but it was really bad ). The accuracy was sub par and wow was it dirty! My Glock 30S and Sig P220 Combat are really dirty from only a couple mags of this ammo out of each gun. I would not recommend this ammo to anyone due to the issues I had with it. I threw the rest of my box in the dude can at our gun club and I am trying to figure out what to do with the rest of the 500 RDS I got!! Very satisfy with the purchase as always; this is the first year in owning firearms or ammunitions. It was just serendipity that I found LuckyGunner. Good ammo for practice, fairly accurate, and not dirty compared to other practice ammo. Lucky Gunner is the only place to shop on-line for ammo, if they don't have it nobody will have it either. I always recieve my order the next day or two days at the most. Good prices and good product. 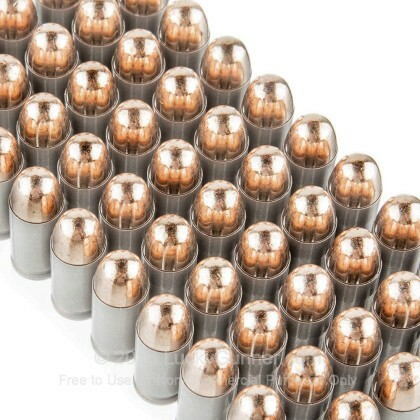 Great ammo- no problems - plan on purchasing more! Good Stuff. Reasonably priced and delivered within a couple of days. Shot 500 rounds through a Glock and a Stery 9mm today. Good accuracy and no FTE/FTFs. Ammo worked perfectly so far, no jams or stove pipes, would buy again! Only gave it a four star rating for quality because you can't re load the cartridge like you can with brass. Out of 1000 rds, found 6 that were up to 3/32" shorter than the rest. It's like the taper crimp or whatever it's called to seat the bullet never happened. It was fairly obvious while looking at the cartridges sitting in the plastic holder, lower than the rest. Seemed to be in 4 boxes in the same side of the case. Just do a quick QC when ya'll get your ammo. Sorry, no lot #, already tossed the box. No problems so far. I'd buy again. So far not a bad round. I find no reason not to continue using this product. Clean running, hot burning, very accurate ammo. Surprising cleanliness when it came time for maintenance. Will buy this ammo again when it is available. Over the years I have shot a LOT of Blazer aluminum-case ammo in various calibers, and never had a problem with any of it. In .45 ACP in particular, it's always been very clean, always given fairly decent accuracy, always given 100% reliability in the guns I've fired it in--Colt and Springfield 1911s, Springfield XDs, Glocks, SIGs, an Olympic AR carbine, and an old S&W revolver that used those little stamped sheet metal clips. It's also normally pretty stoutly loaded, with very noticeable muzzle flash. Production lots vary but the last time I chrono'd any it was doing nearly 880 f.p.s. out of a 5" Springfield 1911, several years back. Cycling, extraction, and ejection are always very positive, bordering on "violent," but that's okay, you can't reload aluminum cases anyway. It's good quality ammo, though I do sometimes wish it were still $8.97 a box at Wal-Mart. I also wish this stuff were still available with the old 200gr "flying ashtray" JHP. Q: What does one round weigh? A: Each cartridge will weigh approximately .04 lbs. This is based on an overall product weight of 41.6 pounds per case. Q: what/how much is the S&H on top of the price???? A: If you add the ammo to your cart, you will be able to see the shipping calculator, which will tell you the cost of shipping after you enter your ZIP code. 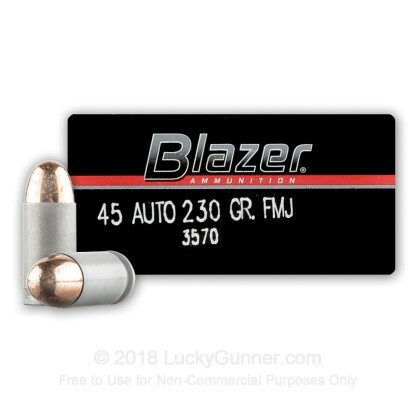 We also have this 45 ACP - 230 gr FMJ - Blazer - 50 Rounds ammo in stock in a smaller quantity.